Neonatal sepsis is an inflammatory systemic syndrome, which is a major cause of morbidity and mortality in premature infants. We analyzed the expression profile data of E-MTAB-4785 to reveal the pathogenesis of the disease. The expression profile dataset E-MTAB-4785, which contained 17 sepsis samples and 19 normal samples, was obtained from the ArrayExpress database. The differentially expressed genes (DEGs) were analyzed by the Bayesian testing method in limma package. Based on the DAVID online tool, enrichment analysis was conducted for the DEGs. Using STRING database and Cytoscape software, protein-protein interaction (PPI) network and module analyses were performed. Besides, transcription factor (TF)-DEG regulatory network was also constructed by Cytoscape software. Additionally, miRNA-DEG pairs were searched using miR2Disease and miRWalk 2.0 databases, followed by miRNA-DEG regulatory network was visualized by Cytoscape software. A total of 275 DEGs were identified from the sepsis samples in comparison to normal samples. 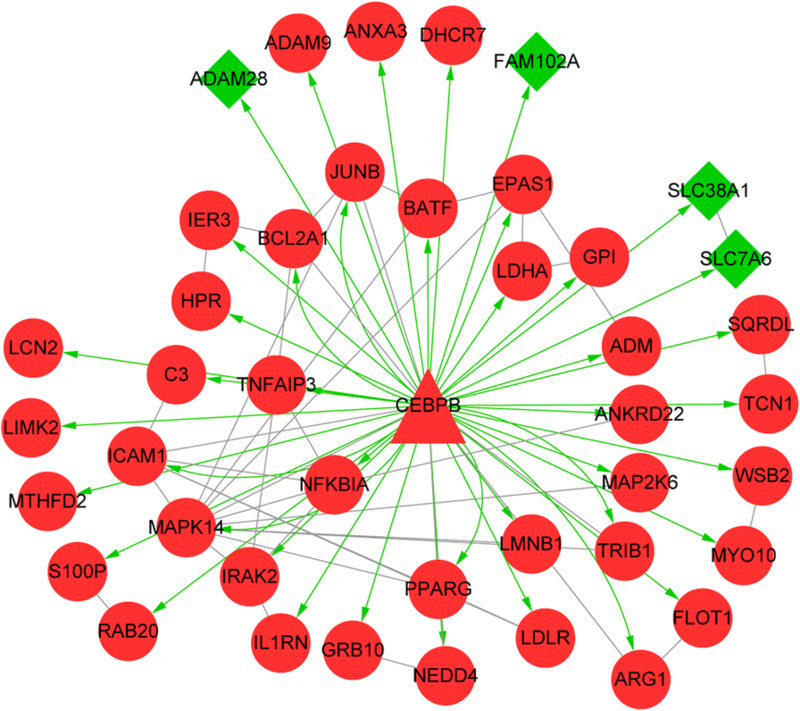 TSPO, MAPK14, and ZAP70 were the hub nodes in the PPI network. Pathway enrichment analysis indicated that CEBPB and MAPK14 were enriched in TNF signaling pathway. Moreover, CEBPB and has-miR-150 might function in neonatal sepsis separately through targeting MAPK14 and BCL11B in the regulatory networks. These genes and miRNA might be novel targets for the clinical treatment of neonatal sepsis. TSPO, ZAP70, CEBPB targeting MAPK14, has-miR-150 targeting BCL11B might affect the pathogenesis of neonatal sepsis. However, their roles in neonatal sepsis still needed to be confirmed by further experimental researches. As a kind of inflammatory systemic syndrome that is determined by a serious infection (bacterial or viral sepsis), neonatal sepsis is composed of early-onset sepsis (EOS) and late-onset sepsis (LOS) . The leading risk factors of the disease are prematurity, prolonged rupture of membranes, and low birth weight . Besides, neonatal sepsis is a main reason for morbidity and mortality in premature infants . Therefore, investigating the molecular mechanisms of neonatal sepsis is urgent and important for developing novel therapies. The key genes and miRNAs involved in the mechanisms of neonatal sepsis have been reported by several studies. For instance, interleukin (IL)-17A is recognized as a effector of IL-18–mediated injury and the outcomes of neonatal sepsis can be improved by disrupting the IL-18/IL-1/IL-17A axis . Previous studies explore pancreatic stone protein (PSP) in neonatal sepsis, finding that PSP is a potential biomarker in combination with procalcitonin in EOS [5, 6]. The overexpression of CD64 is demonstrated to be a highly specific indicator for patients with neonatal sepsis, and CD64 index can be utilized to determine LOS before infants show signs of infection [7, 8]. MiR-15a/16 is a miRNA that may have a critical role in the regulation of gene expression at the post-transcriptional level, which is declared to be useful for the diagnosis and prognosis of neonatal sepsis . In spite of the above studies, the genes and miRNAs acting in neonatal sepsis have not been fully revealed. In 2014, Cernada et al. used genome-wide expression profiles to assess the expression differences between infants with and without neonatal sepsis, finding that the expression profiles have differences in the early days of neonatal period. However, they have not performed comprehensive bioinformatics analysis to reveal the mechanisms of neonatal sepsis. Using the data deposited by Cernada et al. , we further conducted differential expression analysis, enrichment analysis, protein-protein interaction (PPI) network analysis and regulatory network analysis to better or to further investigate the structure and expression of some of the genes that seemed to influence the genesis of neonatal sepsis. The expression profile data of E-MTAB-4785 was downloaded from the ArrayExpress database (http://www.ebi.ac.uk/arrayexpress/), which was sequenced on the platform of the Affymetrix GeneChip Human Gene 1.0 ST Array [HuGene-1_0-st-v1]. E-MTAB-4785 included 17 blood samples from infants with neonatal sepsis (gestational age = 27 ± 2 weeks, birth weight = 1030 ± 231, 11 males and 6 females) and 19 blood samples from infants without neonatal sepsis (gestational age = 28 ± 2 weeks, birth weight = 1130 ± 329, 13 males and 6 females). All very low birth weight (VLBW) infants were selected from the University and Polytechnic Hospital La Fe between April 2011 to September 2012. Sepsis infants were those with clinical signs of sepsis  and/or risk factors [12, 13], while nonseptic infants were those without clinical signs of infection. Venous blood was obtained from sepsis infants and nonseptic infants before starting antibiotics, and stored at − 20 °C for following RNA extraction. The expression profile data of E-MTAB-4785 was deposited by Cernada et al. . The study of Cernada et al. got the approval of the local institutional review board, and informed consent of all participants were provided by their parents or representatives. After the raw data were read by the oligo package (http://www.bioconductor.org/packages/release/bioc/html/oligo.html)  in R, data preprocessing were performed using the Robust MultiArray Averaging (RMA) method , including background correction, quantile normalization and expression calculation. The average value of probes was obtained as the final gene expression value of their corresponding common gene symbol. The Bayesian testing method  in limma package (http://www.bioconductor.org/packages/release/bioc/html/limma.html)  was utilized to identify the DEGs between the two group samples. The p-values were conducted with multiple testing adjustment based on the Benjamini & Hochberg method . The adjusted p-value < 0.05 and |log2fold-change (FC)| > 0.585 were set as the thresholds. The Gene Ontology (GO, http://www.geneontology.org) project describes gene products from biological process (BP), cell component (CC) and molecular function (MF) aspects . The KEGG (Kyoto Encyclopedia of Genes and Genomes, http://www.genome.ad.jp/kegg/kegg2.html) database involves not only genes but also their functional information . Using the DAVID (Database for Annotation, Visualization and Integrated Discovery, version 6.8, http://david.abcc.ncifcrf.gov) online tool , GO functional and KEGG pathway enrichment analyses were carried out for the DEGs. The p-value < 0.05 was selected as the cut-off criterion. Using the STRING database (version 10.0, http://string-db.org) , the PPI analysis was conducted for the DEGs, with the required confidence (combined score) > 0.4 as the threshold. Followed by the PPI network was visualized by the Cytoscape software (http://www.cytoscape.org/) . Based on the CytoNCA plugin  in Cytoscape software, degree centrality (DC), betweenness centrality (BC) and closeness centrality (CC) of nodes were analyzed to identify hub nodes . In addition, module analysis was conducted for the network using the MCODE plugin  in Cytoscape software. Using the iRegulon plugin  in Cytoscape software, the transcription factor (TF)-DEG pairs in the PPI network were predicted, with the Normalized Enrichment Score (NES) > 3 as the threshold. Then, TF-DEG regulatory network was visualized using Cytoscape software . The sepsis-associated miRNAs were searched from the miR2Disease (http://www.mir2disease.org/) database , and then their targets were downloaded from the miRWalk 2.0 (http://zmf.umm.uni-heidelberg.de/apps/zmf/mirwalk2/genepub.html) database . 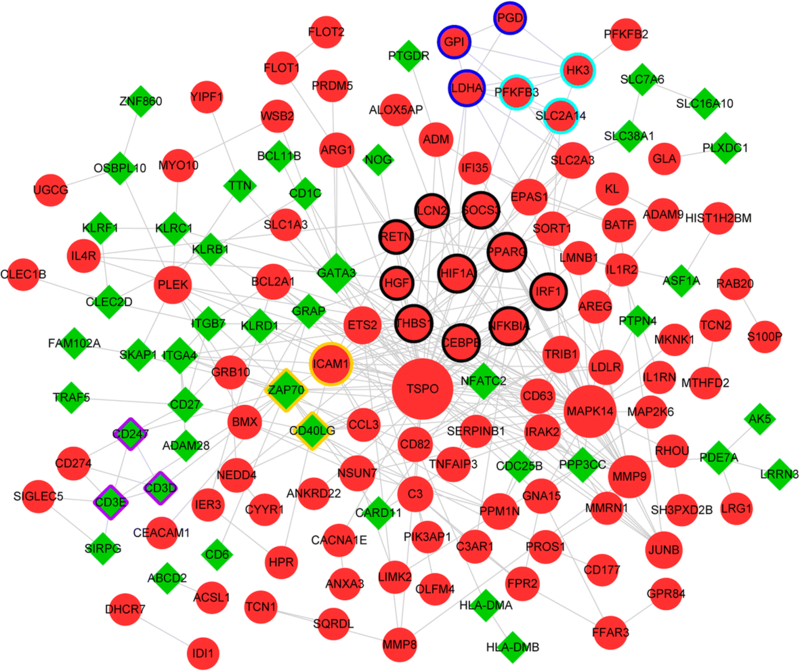 Through mapping the target genes into the DEGs, the sepsis-associated miRNA-DEG pairs were screened and then miRNA-DEG regulatory network was constructed by Cytoscape software . Through data preprocessing, the expression values of 18,718 genes were acquired. Compared with normal samples, there were a total of 275 DEGs in the sepsis samples, including 180 up-regulated genes and 95 down-regulated genes. Therefore, there were more up-regulated genes in relative to down-regulated genes. GO functional and KEGG pathway enrichment analyses separately were conducted for the up-regulated genes, and the top 5 terms in each category were listed in Table 1. The terms enriched for the up-regulated genes included cellular response to lipopolysaccharide (BP, p = 3.05E-06), extracellular exosome (CC, p = 3.26E-06), histone acetyltransferase binding (MF, p = 2.54E-03), and TNF signaling pathway (pathway, p = 3.65E-06). Meanwhile, the top 5 terms enriched for the down-regulated genes were listed in Table 2, including regulation of immune response (BP, p = 4.11E-15), T cell receptor complex (CC; p = 1.22E-10; which involved zeta-chain-associated protein of 70 kDa, ZAP70), transmembrane signaling receptor activity (MF, p = 4.20E-06), and T cell receptor signaling pathway (pathway; p = 4.90E-07; which involved ZAP70). A PPI network was visualized for the DEGs, which involved 144 nodes and 311 interactions (Fig. 1). According to the DC, BC and CC scores of nodes, translocator protein (TSPO), mitogen-activated protein kinase 14 (MAPK14), and ZAP70 were the hub nodes in the PPI network (Table 3). Based on the MCODE plugin, a total of 5 modules were identified from the PPI network. Among which, the genes involved in module 1 (which had the highest score, score = 3.333) were mainly enriched in TNF signaling pathway (p = 4.59E-03), pathways in cancer (p = 5.42E-03), and osteoclast differentiation (p = 6.97E-03) (Table 4). A TF-DEG regulatory network was identified from the PPI network, in which the TF CCAAT/enhancer binding protein (C/EBP), beta (CEBPB) targeted 43 DEGs (such as MAPK14) (Fig. 2). Besides, pathway enrichment analysis was also conducted for the genes involved in the TF-DEG regulatory network, the enriched pathways included TNF signaling pathway (p = 4.89E-07, which involved CEBPB and MAPK14), Epstein-Barr virus infection (p = 2.09E-04), and osteoclast differentiation (p = 5.64E-04) (Table 5). According to the miR2Disease database, has-miR-150 was obtained as a sepsis-associated miRNA. Followed by the targets of has-miR-150 were downloaded from the miRWalk 2.0 database. Among the targets, 8 genes (including 3 up-regulated genes and 5 down-regulated genes; such as B-cell CLL/lymphoma 11B, BCL11B) were differentially expressed in this study. In addition, the miRNA-DEG regulatory network is showed in Fig. 3. In this study, there were 275 DEGs (including 180 up-regulated genes and 95 down-regulated genes) in the sepsis samples compared with normal samples. A PPI network for the DEGs was constructed, in which TSPO, MAPK14, and ZAP70 were hub nodes according to the DC, BC and CC scores. Besides, a total of 5 modules were screened from the PPI network. Furthermore, CEBPB-DEG regulatory network and has-miR-150-DEG regulatory network separately were constructed. TSPO (also named the peripheral benzodiazepine receptor) functions in the regulation of inflammation and immune function, and its antagonist PK-11195 can relief cigarette smoke extract-induced inflammation . Santoro et al. demonstrate that TSPO ligands can lower pro-inflammatory enzymes and oxidative stress in glial cells via the biosynthesis of neurosteroids, thus these compounds may be used for treating inflammatory-based neuropathologies . The MAPK14/p38α signaling is considered as a central pathway for integrating useful signals in dendritic cells for inflammation and TH17 differentiation . The p38 kinase plays roles in responses of T cells and inflammation, which mediates the production of crucial inflammatory regulators (including IL-1β; TNFα; and cyclooxygenase-2, COX-2) through cells of the innate immune system . The p38 MAP kinase signal transduction pathway plays an essential role in regulating inflammation and proinflammatory cytokine production, and inhibiting p38α isoform is sufficient and necessary for anti-inflammatory effect . Enrichment analysis showed that ZAP70 was enriched in the function of T cell receptor complex and the T cell receptor signaling pathway. The function deletion of the ZAP70 tyrosine kinase in humans can lead to a serious immunodeficiency, characterized by non-functional CD4+ T cells and lacking mature CD8+ T cells . In ZAP70-deficient patients, circulating T cells are under inadequate supervision, no longer differentiate into TH2 T cells, are short of inhibitory growth controls, and show decreased apoptosis, finally developing into inflammation and autoimmunity . These declared that TSPO, MAPK14, and ZAP70 might play critical roles in neonatal sepsis. Through inducing the CEBP family, endoplasmic reticulum (ER) stress results in inflammatory responses in response to palmitic acid stimulation in pancreatic acinar cells, wherein CEBPB activation induces CEBPA activation . As a key transcription factor affecting metabolic disturbances, CEBPB is critical for the maturation and differentiation of adipocytes and is overexpressed during proinflammatory conditions and ER stress . Pathway enrichment analysis indicated that CEBPB and MAPK14 were enriched in TNF signaling pathway. In the TF-DEG regulatory network, MAPK14 was targeted by CEBPB, indicating that CEBPB targeting MAPK14 might function in neonatal sepsis through TNF signaling pathway. Vasilescu et al. demonstrate that the levels of miR-150 in both plasma and leukocytes are associated with sepsis aggressiveness and thus can act as a biomarker of early sepsis . Decreased miR-150 serum levels correlate with an adverse outcome in patients with sepsis and critical illness, and circulating miR-150 serum concentrations may be used as a potential prognostic marker in patients with critical illness . Previous studies reported that BCL11B is not only a transcription factor specific in T-cell, but also contributes to the lineage fidelity and the genetic and functional programs of mature type 2 innate lymphoid cell (ILC2) [41, 42]. 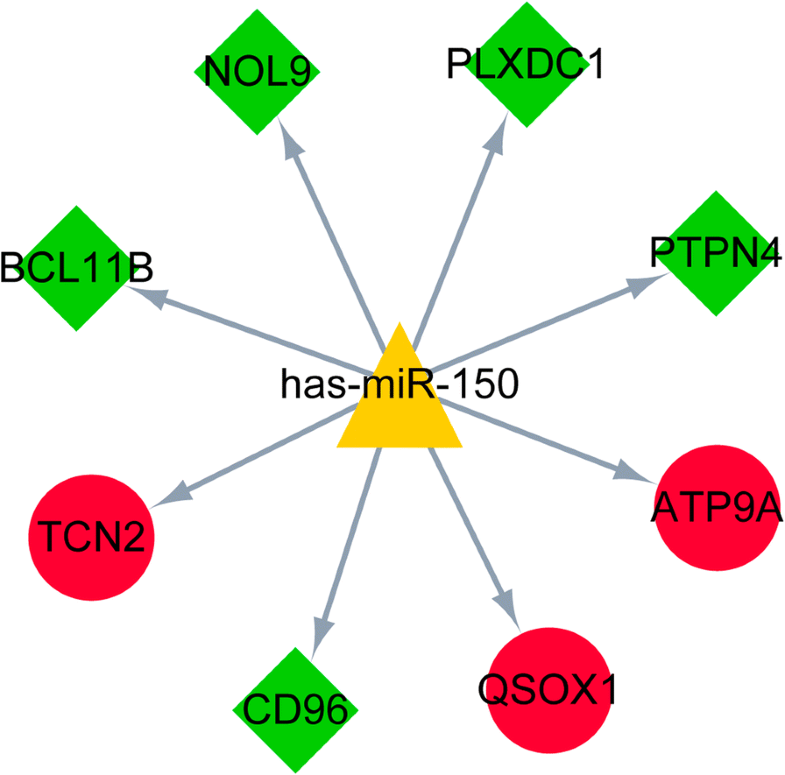 In the miRNA-DEG regulatory network, BCL11B was targeted by has-miR-150, suggesting that has-miR-150 might be involved in the pathogenesis of neonatal sepsis by targeting BCL11B. In conclusion, a total of 275 DEGs were identified from the sepsis samples. Besides, TSPO, ZAP70, CEBPB targeting MAPK14, has-miR-150 targeting BCL11B might act in the pathogenesis of neonatal sepsis. However, further experimental researches are needed to confirm these results obtained from bioinformatics analysis. LH conceived and designed the research. LQ and HZ acquired the data. LH, LJ and LY analyzed and interpreted the data. LH drafted the manuscript. LH and LJ revised the manuscript for important intellectual content. All authors read and approved the final manuscript. The study of Cernada et al. got the approval of the local institutional review board, and informed consent of all participants were provided by their parents or representatives. The consent for publication of all participate were required.